I've thought about doing a Barkbox vs Petbox post for awhile but the boxes tend to arrive in different weeks and I don't have time for that. This time, Petbox shipped earlier than usual and my Barkbox was still waiting for review. So I decided that now is the time! Both these boxes are designated for Small dogs. 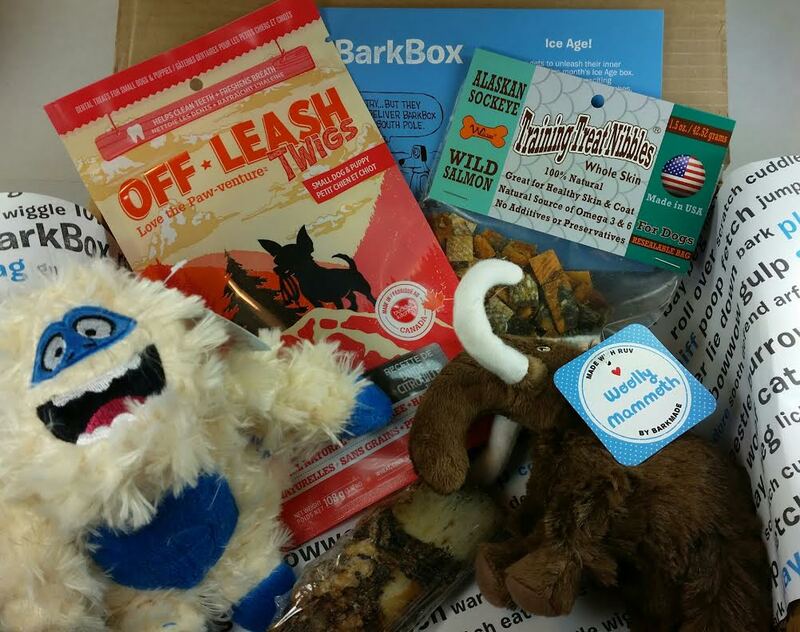 This is the January 2015 Barkbox. It contains two plush toys, two bags of treats and one single treat bone. One thing Barkbox does, and does very well, is themes. This theme is Ice Age and they did another great job keeping with it. Barkbox also comes with an information card detailing the items included, along with their prices. 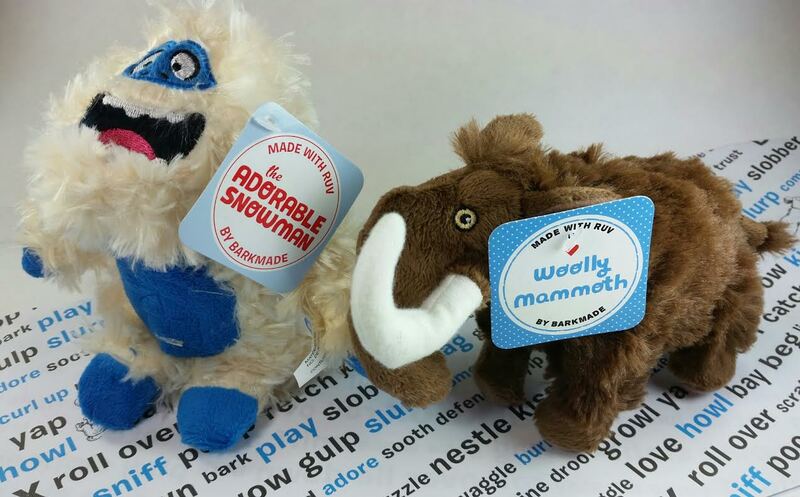 Here we have an Adorable Snowman and a Woolly Mammoth. These are made by Barkbox (either that or commissioned by Barkbox, I'm not sure) and they are seriously great. Currently, the Adorable Snowman has been disemboweled but Dexter still plays with him. The Woolly Mammoth is still alive and well. Well-loved, also. 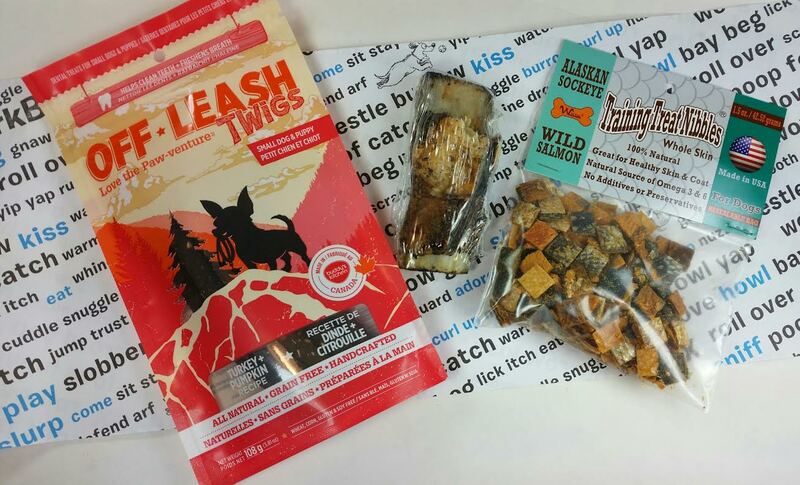 We received some Complete Natural Nutrition Off Leash Twigs ($8), a roasted bone and some of the most awful smelling Aussie Naturals salmon skin treats ($8) ever. Let me just say that these salmon treats should not be called training treats. No one is going to want to touch them. They REEK! I sprinkled some over the dogs food and then they were burping up salmon. I had to throw them away. The Heartland Premium Rib ($2) was a great chew with lots of marrow. VERDICT: Two great toys my dogs loved plus the bag of Twigs and the bone were all wins. The salmon treats? No. Value as stated on the card: $37 but I'm thinking the price of the salmon bits at $8 is pushing it. Still worth at least the $29 regular price, though. I'm on a one year subscription so it's definitely worth it to me since I pay a little under $20 a box. On to Petbox! Petbox doesn't have themes or an information card. They do seem to work with different brands than Barkbox because the toys and treats rarely overlap. However, the brands they do use appear often and sometimes duplicates can appear over a few months. 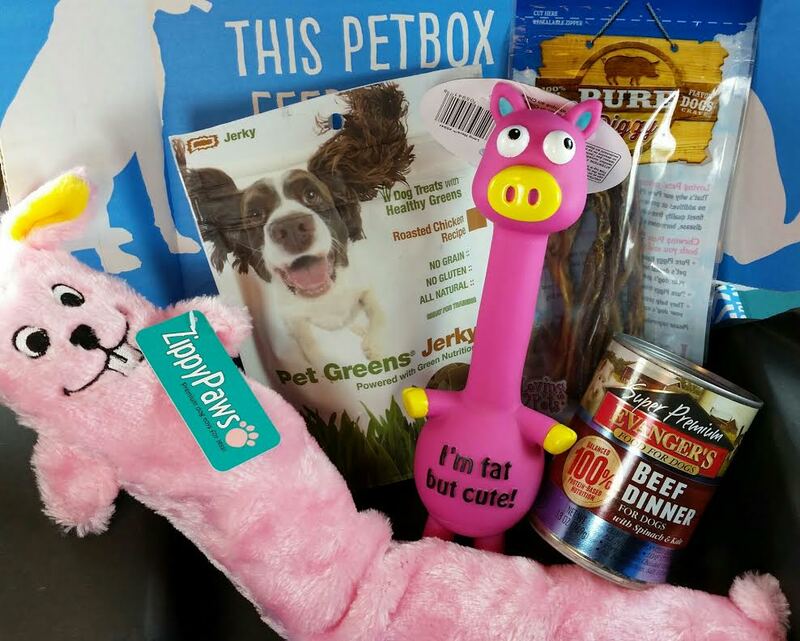 This Petbox has one big, fuzzy squeaker toy, one plastic squeaky pig, two bags of treats and a can of dogfood. I do have to say that Petbox puts more actual food in their boxes than Barkbox does. I've gotten a couple cans and then some dried food you reconstitute with water. I actually like getting it since it adds variety but I don't have to go out and buy it. The Spot Long Neck pink plastic pig ($8.99) lasted maybe two minutes before his curly tail and left leg had been chewed off. I let Bugsy play with it for a little bit longer before I took it away because I was so surprised he liked a plastic toy like this. I ended up taking it away because I didn't want him to swallow pieces of plastic. The ZippyPaws fuzzy pink bunny ($8) sent Bugsy into raptures. It had three huge squeakers in it. Like the Invincibles snakes, if you know what those are. The squeaks were SO loud and he loved it. Running around tripping on it as it tangled between his paws. Then he got to work ripping all those glorious squeakers out. He loves squeakers once they don't squeak anymore. He will make a little (or big in the case of these) pile next to my foot, then sit there and stare at me and make wuffle noises to get my attention. Begging me to kick them so that he can go collect them all. Evangers Beef Dinner ($2) is new for us. I actually meant to give it to the boys tonight but I forgot. The Pet Greens Jerky ($7.99) is amazing! I wish I could eat it. It smells good and is nice and dry so it goes well in a pocket for training. 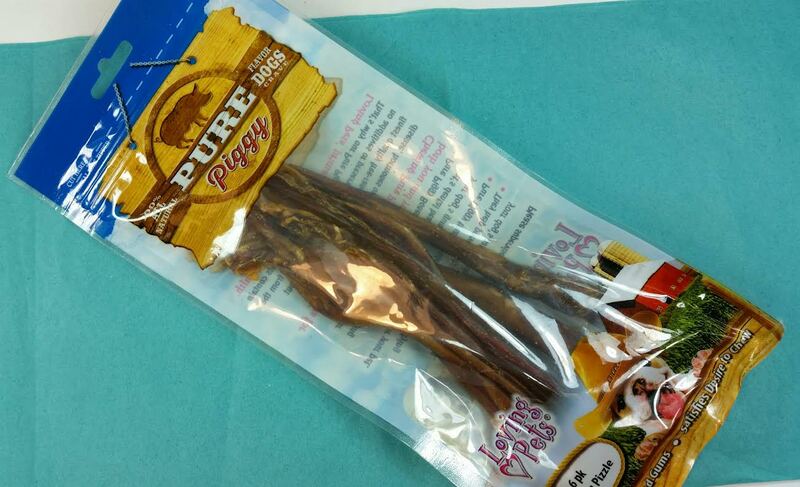 Then we also got a 6 pack of Loving Pets pig pizzle sticks ($6.99). Which of course were a hit. My dogs loved these. They didn't last quite as long as a bully stick, though. VERDICT: I feel like this might have been one of my best Petboxes. The value of the box is $34 which I put on par with the Barkbox value. There were two different types of toys, although that plastic one was not ideal and had to be tossed pretty much immediately. 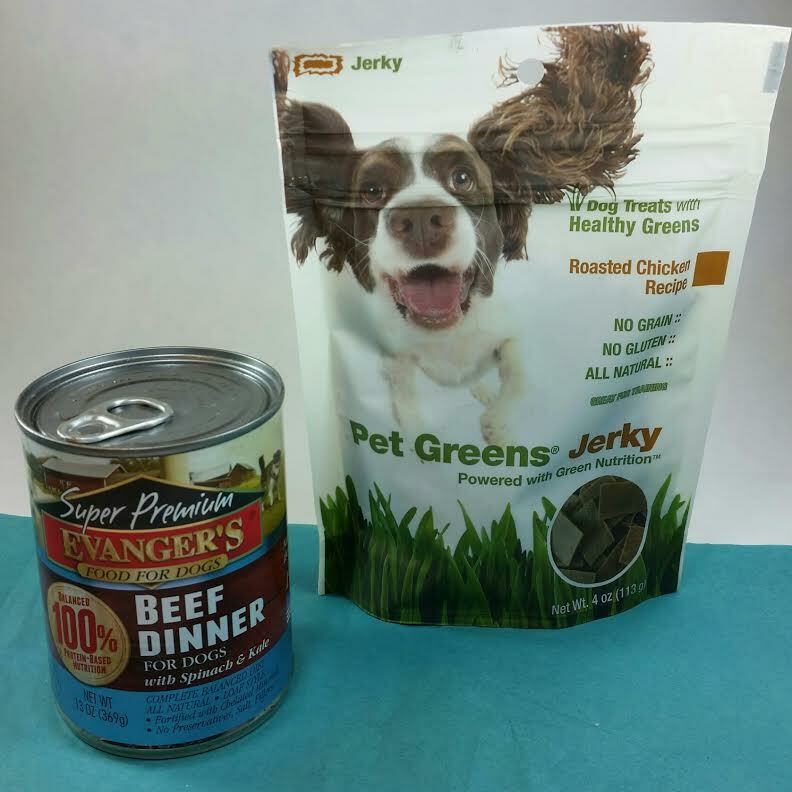 Loved the treats in this bag and the can of dog food adds variety to the dogs' diet which is nice. Both boxes had something that had to be tossed. 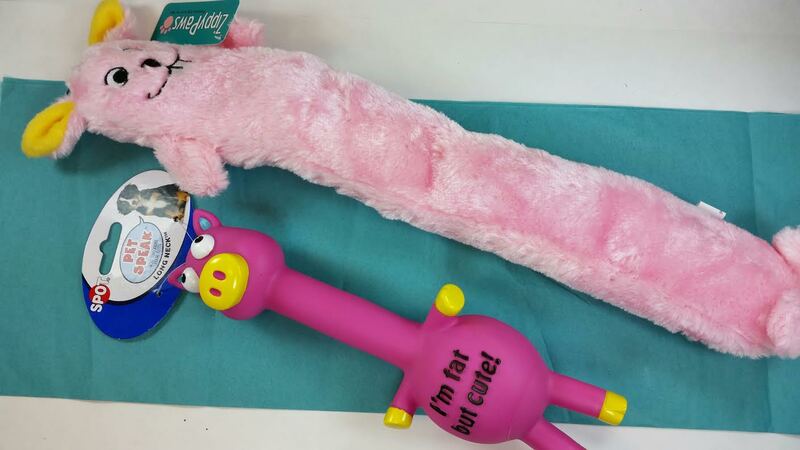 Barkbox and the salmon treats and Petbox and the plastic pig. Both boxes had one toy that became a hit. 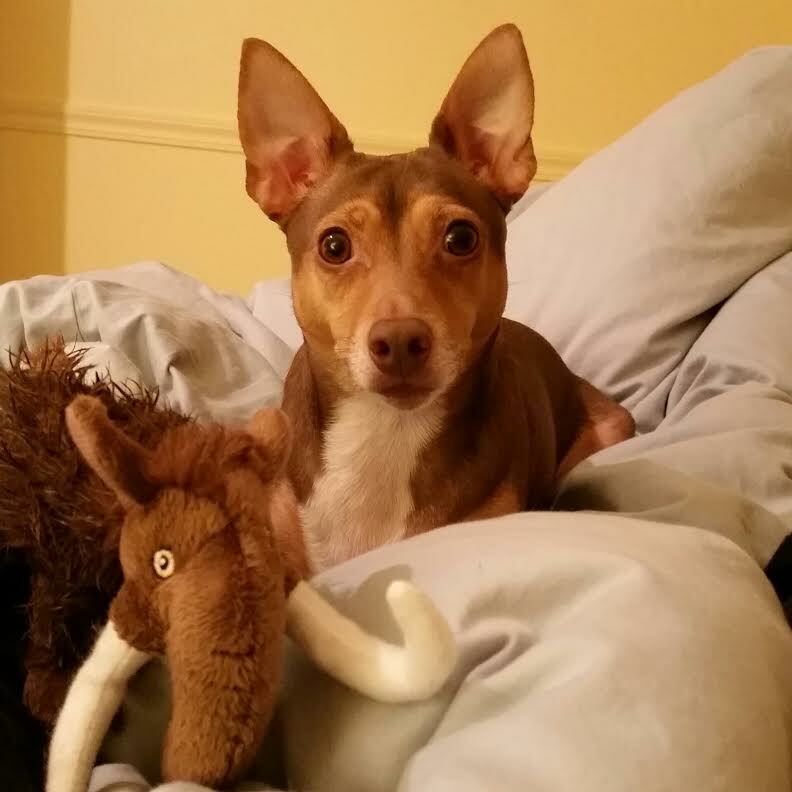 The woolly mammoth from Barkbox and the Bunny Squeakers from Petbox. I liked the treats in the Petbox better, though, because they go farther. The pizzle sticks from Petbox are probably on par with Twigs from Barkbox-- they're both a six pack. But the Petbox jerky treats trump the bone for sure. Clear winner? No. But I'm going to have to put Petbox a smidge above Barkbox this month because of the treats. These boxes are the same price (the Petbox is a $29.99 Promo version I bought a year of on Gilt City that's unavailable as a choice on their site). Which should give Barkbox the edge because at least there's a $29.99 version readily available. If I was to discount the contents of the box and go for the subscription aspect of it, I have to say Barkbox wins. Every month on the 15th the box ships. Petbox maybe ships the 26th of the month. Barkbox has the best website interface. It's so easy to cancel right from your account. Petbox' website is clunky and ugly. Barkbox usually has coupons available. You can get 10% off with my referral link. Petbox has cat subscriptions or a combination of both. Four subscription options, starting at $9.95. Barkbox has a Tiny Dog option for dogs under 10lbs. If you want, you can choose your items for your Petbox. Both subscriptions source toys and treats from the USA. NO treats from China ever. Ebates gives you $3 cashback on your Barkbox purchase. Haha! The things we do to spoil our dogs! I don't mind repeat treats from brands made in the USA and all that. As long as they are actually good treats that the dogs will eat. They don't care. The problem I was having with all those Loving Pet repeats was that they sent the dang Chicken version every time. Bugsy can only eat so many treats and Dexter can't eat chicken so I still have a bag sitting unopened (because one is already open). WOW! I think I need to get in on that grab bag action. Bully sticks are so expensive but my dogs love em to death and it makes me sad to deny them treats. Spoiled dogs is right! Thanks for the recommendation!